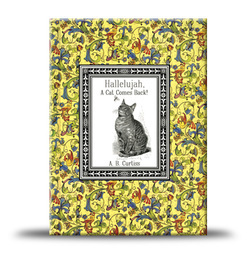 This book is not just for children but for the young in spirit and cat lovers everywhere. Meet Hallelujah, a cat with character thanks to the wisdom of his Old Granny. In this Granny Cat's book of virtues, the advice is to stick to the straight and narrow path of good character. A cat should not beg, steal or borrow. Your life must be more than CATch as CATch can. A wish is not a fish. A plunge is not a plan." No matter what happens to you, Granny tells Hallelujah, as he leaves home to seek his fortune in the wide world, some cat has lived through it and so can you. "When life turns dark and things look black,"
Here she buttoned my coat and she tightened my pack. "Just remember, dear, that a CAT comes back." There's nothing over which some CAT's not risen. Don't sit around and "CATerwaul. CATapult back up from where you fall." "This is a charming book about overcoming hardships and maintaining character. Beautifully written and illustrated. This is a great gift for children and adults." "As with all of A. B. Curtiss's books, this one offers both adults and children many reminders that we should progress through our lives with optimism. When faced with a low point, like the song, "pick yourself up, dust your self off, and start all over again." Once, again, this book is beautifully illustrated and of superior quality, making it a lovely gift. Hallelujah!" "This Book is Wonderful, it Made Me Think!"